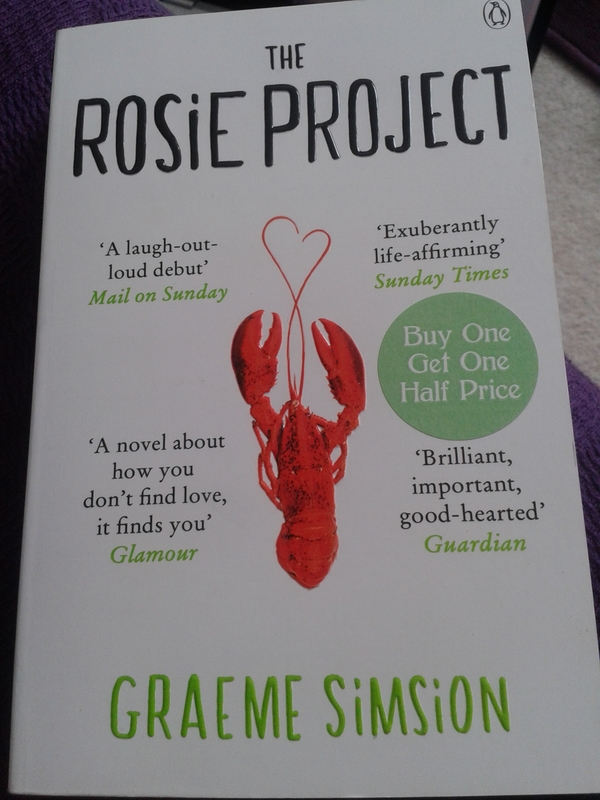 The Rosie Project is the second book I bought in King’s Cross on the way home from the London Book Fair. I’ve been hearing good stuff about this book on Twitter, and noticed that the sequel has now been published with good reviews, so it was as good a reason as any to give it a go! It’s been a while since I’ve read this kind of book – truly uplifting and comical, light-hearted but written with such passion and talent. I read it extremely quickly – devoured it within a day or two. Love isn’t an exact science – but no one told Don Tillman. A handsome thirty-nine-year-old geneticist, Don’s never had a second date. So he devises The Wife Project, a scientific test to find the perfect partner. Enter Rosie – ‘the world’s most incompatible woman’ – throwing Don’s safe, ordered life into chaos. Just what is this unsettling, alien emotion he’s feeling? Don Tillman is a very Sheldon-esque character (Sheldon as in the Big Bang Theory, of course) who is acutely aware of the differences between him and other ‘normal’ people. Although, hilariously, he is asked to give a presentation on Asperger’s syndrome and during this he fails to see the similarities between himself and those he is describing, despite at some point exclaiming, ‘All the rational solutions came from the aspies.’ He struggles with the concept of emotions, of the nuances in social interaction, and lives a life ruled by logic, order, and routine. I now believe that virtually all my problems could be attributed to my brain being configured differently from those of the majority of humans. This book has similar themes to the last book I read, The Humans, which also explores the differences and the battle between emotion and rationality. The difference here is that main character immediately gains the reader’s sympathy. He tries his hardest to fit in to the best of his abilities, but knows his own shortcomings. This is was exactly the sort of input I was looking for – subtle nuances of language that I am not conscious of. It struck me that if the respondent was someone like me she would not notice the difference, but it was unreasonable to require that my potential partner share my lack of subtlety. This is what makes things so hard for him when he’s trying to find a wife. The only solution to his dating failures, in Don’s eyes, is to create a compatibility questionnaire, and evaluate potential life partners based on their scores. Very scientific, very logical. But obviously we know that this isn’t as fool-proof a plan as Don believes. It doesn’t help that in the process of trying to understand romantic relationships and the unspoken rules that come with them, Don’s best friend Gene thoroughly confuses him by being a serial adulterer. Witnessing Don’s slow realisation that perhaps this isn’t as OK an arrangement as he was once led to believe really makes you feel for both him and Gene’s wife, Claudia. Don’s achievements in building up an understanding and learning what is right and wrong throughout his journey are only more impressive because of the people he surrounds himself with, who are dysfunctional for entirely different reasons. In comes Rosie, who is far from perfect, especially in terms of Don’s criteria. She smokes, she drinks, she’s highly emotional, and quite frankly everything that Don isn’t. But Rosie is a perfect example of how opposites attract and how opposites can have positive effects on one another. As I took orders, I observed a change in the dynamic of the ecosystem, evidenced by Rosie looking annoyed as she came past me. Ultimately Don has to realise that he cannot rely solely on rationality and logic to see him through his social problems, and that there isn’t one sole solution to any given problem. What makes this book so entertaining and believeable is that it shows how even the most stubborn of people can evolve their ways and their understandings. As a publishing professional working in academic publishing, this book gave me even more enjoyment as it is all too easy to regard scholars and academics, who are at the top of their respective fields and work hard on maintaining high levels of professionalism, as people who are immune to the follies and struggles of everyday normal life. Putting people such as these into funny and romantic situations gives a refreshing and entertaining twist to the academic community and lifestyle. The Rosie Project is fun, gripping, easy to read, and leaves you wanting more. Which is good, because its sequel The Rosie Effect recently been published. Time for me to go and buy it!